Embarking on yet another New Year’s program to transform your life? Will you finally finish a marathon in 2019 or embrace meditation and a healthier lifestyle? Yawn. How about following the way of the Jedi to find your inner Force instead? The Star Wars Fuel Your Force program is about finding strength and balance in your life by taking inspiration from the Star Wars galaxy. “For the Jedi it is time to eat as well,” so the program includes balanced nutrition and healthy recipes, such as blue milk and a recipe for fruitsabers and Jedi dip. There’s also an eight week training video that was introduced last year, and there are thousands of health and fitness apps available to keep you on track. However, you can also follow in the footsteps of many others and walk or run while listening to the music of Star Wars created by John Williams. What better inspiration? Of course, redoing your diet and upping your exercise are only part of the program. 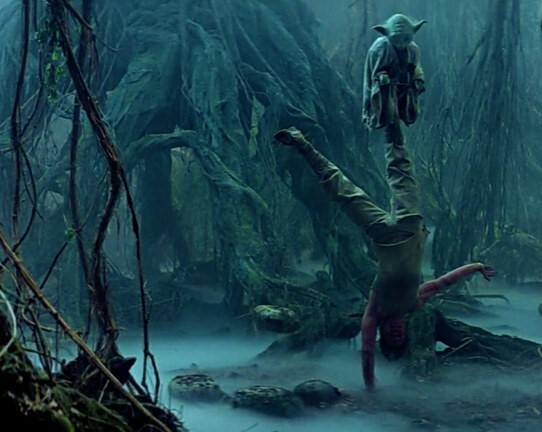 Meditation is important to a Jedi, and while Master Yoda is the ultimate guide, there are other options. In his GatesNotes blog, Bill Gates recounts that for a period of time when he was in his 20s, he stopped listening to music and watching TV to help improve his focus. He talks about why he’s come to believe in meditation (he used to regard it as a “woo-woo thing tied somehow to reincarnation”) and recommends Andy Puddicombe’s The Headspace Guide to Meditation and Mindfulness and the Headspace app.